Complete Guide to Truck Lettering, Pinstriping and Graphics covers lettering pinstripe estimating and selling. Designing a Pinstripe or Lettering Job. Conditions and locations for Pinstriping an Graphics application. 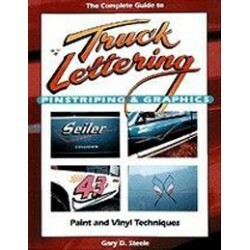 Complete Guide to Truck Lettering, Pinstriping and Graphics also has proper Pinstriping an Graphics tools, brushes and paints instructions. Techniques and tips for Complete Guide to Truck Lettering, Pinstriping and Graphics are discussed such as Pinstriping and decoration. Vinyl lettering and the Gold leaf application process. Complete Guide to Truck Lettering, Pinstriping and Graphics also has information on Pinstriping material sources and buyers guide. Paperback by Gary Steele.